Newsweek's Best Hospitals in the U.S.
Emory University Hospital has been named a Top 100 Global Hospital in Newsweek’s World’s Best Hospitals' 2019 list. 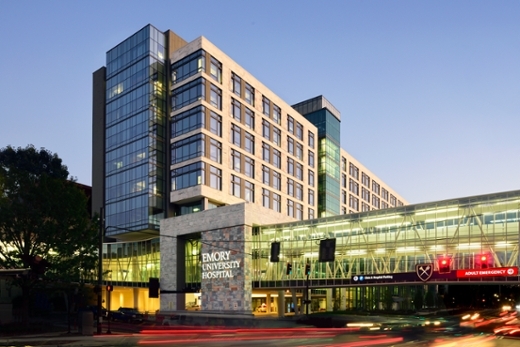 Emory University Hospital is the only hospital in Georgia, only one of two in the Southeast and one of 25 in the U.S. to make the global list. The inaugural list recognizes the best hospitals across 11 countries: U.S., Canada, Germany, France, United Kingdom, Switzerland, South Korea, Japan, Singapore, Australia and Israel. The countries were selected based on standard of living/life expectancy, population size, number of hospitals and data availability. Newsweek partnered with Statista Inc., a global market research and consumer data company, to develop the ranking of the world’s best hospitals. One-thousand hospitals were selected to participate based on recommendations from medical professionals, patient survey results and medical performance indicators. Tens of thousands of doctors, hospital managers and other health care professionals were then invited to take an online survey of those hospitals. Hospitals are also divided by country and each hospital received a score and ranking in the individual country lists. Emory University Hospital ranks #25 in Newsweek’s Best Hospitals in the U.S. list, Emory Saint Joseph’s Hospital ranks #132 and Emory Johns Creek Hospital ranks #133. Scores are only comparable between hospitals in the same country. Hospitals had to have a capacity of at least 100 inpatient beds to be considered for the survey.